We create apps that offer Utility & Entertainment. Get your favorite game or care for your android device with one of useful applications. Nitros Apps is a leading company in the mobile development arena. We aim to build simple, interactive, safer and faster mobile apps for millions of users around the world. With an exponentially increasing download rate of the apps we have developed so far, we look forward to taking the Play Store by storm! Awesome Rating. Higher Download Rate. Multitude of Users. The statistics portray the excellence of the apps we hand-code. 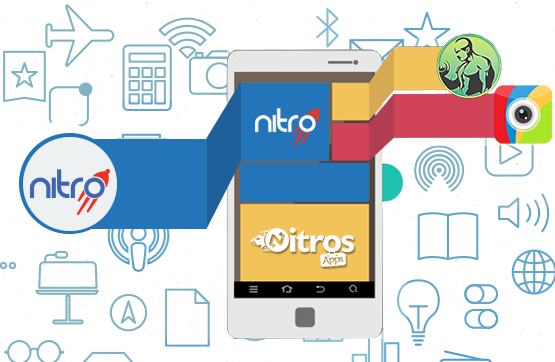 Nitros Apps is such a trusted name in the mobile development arena that you can trust without a second thought. Our company is all about the development of creative apps and addictive games. Every app we create at this platform offers nothing but value to mobile users. The apps vary in terms of usability yet some features stay the same. No matter which app you download, you can find an interactive interface, simple functions, state-of –art design and unforgettable user experience. The mobile application developers bring some of the most creative ideas to life by the development of user-friendly mobile applications. They don’t just chalk out an amazing mobile development strategy but also hand-code apps that are perfect in every aspect. Download apps today to use best mobile apps available! Enhance your mobile’s performance and improve lagging apps with just a touch on your mobile screen! With Pro Fit Workout Planner in your device, you don't have to visit any gym for an ideal body shape! HiDef Photo Editor is a one stop shop for all your photo editing needs. Download now and show your photos to friends with expressive emoticons!